Berkeley, CA—15 July 2011—G4tv’s Blair Butler announced yesterday that she’s making her professional comics writing debut at Image Comics this November, with a four-issue miniseries called HEART. 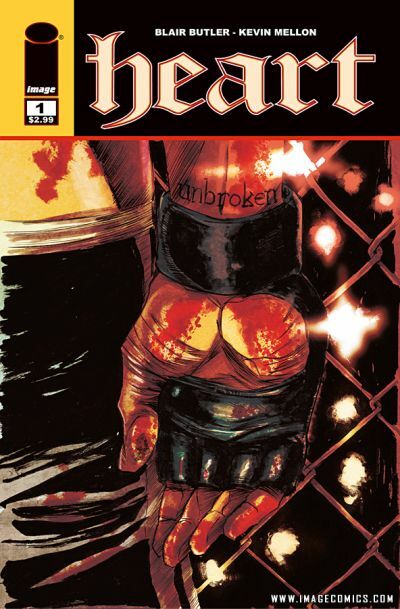 Featuring art by LOVESTRUCK artist Kevin Mellon with lettering and design by Crank!, HEART combines Butler’s love of both comics and mixed martial arts for a story that’s both full of action and emotionally gripping. HEART chronicles the struggles and victories of a spirited young fighter named Oren as he forges ahead through a difficult, frequently painful career path. Even though Mellon is illustrating pages chock-full of fight scenes, he has described the story of HEART as like nothing else in comics right now. HEART #1, a 32-page black and white comic book, will be available to order in the September issue of Previews, and goes on sale in stores in November for $2.99.